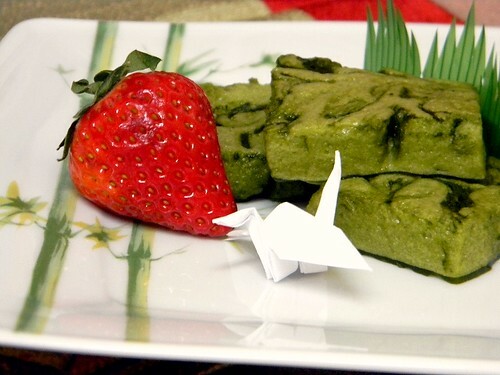 For Japan, I made paper cranes and matcha green tea marshmallows. 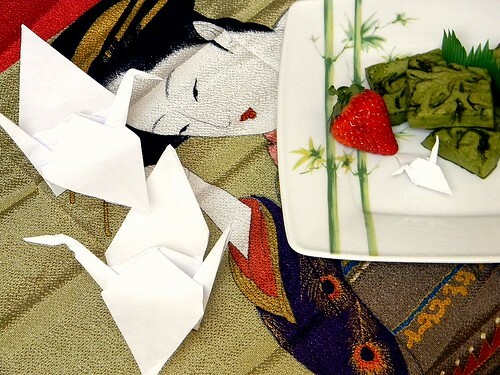 Green tea is a large part of Japanese culture. There are several types of green tea based on how the leaves are grown such as climate, growing period, etc. that ultimately affects the cup of tea brewed and how it is used; for example, matcha is traditionally used in and prepared for tea ceremony. 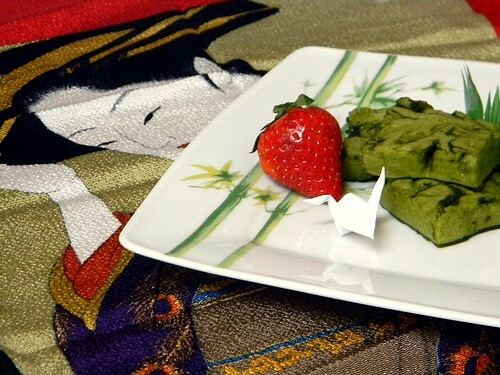 Matcha is also a popular ice cream flavour. Because of the matcha powder, these marshmallows are more on the side of bittersweet. The green tea flavour would pair beautifully with white chocolate, an idea if you can have dairy and sugar. I’ve yet to see a dairy-free white chocolate, let alone sugar-free. I made a number of paper cranes and posted pictures on the Paper Cranes for Japan Facebook page, which was started by DoSomething.org, to show support for the Japanese. The aim is to reach 100,000 digital images of paper cranes that represents wishes of relief and healing for all those affected by the massive earthquake and tsunami that hit Japan. I wrote more about this on trend & chic, as well as sharing more pictures of the paper cranes I folded in addition to those ones shown here. If marshmallows still aren’t your thing or at least not matcha-flavoured, check out my regular honey- or agave-sweetened marshmallows or another Japanese confection, dorayaki. If you want taller marshmallows, pour the marshmallow mixture into a smaller pan or dish. Chill a large mixing bowl and a balloon whisk in the freezer for a few minutes, or longer. Cook 3/4 cup of the water, honey, and salt over medium heat, covered, for 3 minutes. Increase heat slightly to bring it to a gentle boil and cook until it registers 200ºF on a candy thermometer. While the syrup is cooking, sprinkle gelatin over the remaining 1/4 cup of water in the chilled bowl to soften the gelatin. Pour the syrup slowly into the softened gelatin, whisking gently. When all the syrup is poured in, increase your speed and mix vigourously. It will start frothing and soon become white, although it will still be thin. 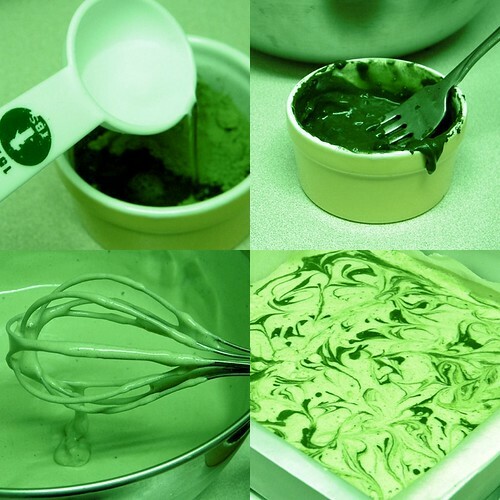 When it is completely opaque, add a spoonful of the mixed matcha and continue whisking as it gradually thickens. At some point during mixing, as the marshmallow gets thicker, you may wish to switch to a smaller balloon whisk for better dexterity and ease of control. Add the vanilla extract and whisk for about a minute or two longer. Scrape the marshmallow with a rubber spatula, preferably flexible, into a 9″ by 9″ pan or dish lined with wax or parchment paper. Spread evenly. * Swirl the remaining matcha on top with a toothpick or similar thin implement and allow to set. To test if it’s set, touch the surface with your fingertip: it shouldn’t stick to your finger at all, without marshmallow left on your finger. When the marshmallow is set, slice into squares. Enjoy! *If the marshmallow has already started setting and it’s difficult to spread, gently heat the marshmallow in the same pot you cooked the syrup in until it is a thick, viscous consistency again. Pour into the prepared, lined pan and spread. It will set. That marbling effect adds to the marshmallows’ visual appeal, I find. Thanks, Richard! Thanks, Esh, and thanks also for that bit of info! How lovely , what a truly beautiful touching heartfelt caring gesture , God bless you and I will continue to pray for all . I want to thank you for all you created and shared here. Thank you, Kathy, and you’re most welcome. Everyone has Japan in their thoughts and prayers. Hi Shellina, thanks! I hope you like them. Zoe, get out! THIS IS BRILLIANT!!! I cannot believe what a great idea this is! And could not be more perfect timing for St Patty’s day! I would love to give these a try! Great post! Excellent recipe. Thanks for sharing this post. I really enjoy reading your blog. Feel free to check out our recipes.